As part of a MindLab postgrad course I am doing this year, one of the assessment series I have chosen to do is linked into how I approach the inquiry experiences that I set for students in my modules. Because we see more value in assessing students by how they inquire into their learning contexts, rather than giving them 'end of topic' tests or exams, we have not yet have our Y9 and Y10 students experience those periods of intense exam-week stress. I see this as being a valuable thing, and know that we will help our students prepare for when/if they choose to sit NCEA externals down the line - but not as a process of sitting an exam for exam's sake. Test/exam strategies are an important skill to learn, just like how to write a good essay, or how to solve algebra problems, or how to apply learning in a cross-curricular manner, but I really believe at a junior level, sitting lots of tests and exams does more harm than good. I digress slightly! However, something that's been on my mind is that sometimes our students end up with multiple inquiries all being due at the same time (often the end of terms, when many modules have done some front-loading teaching and learning). This isn't always a problem, but for some students can cause them some stress. 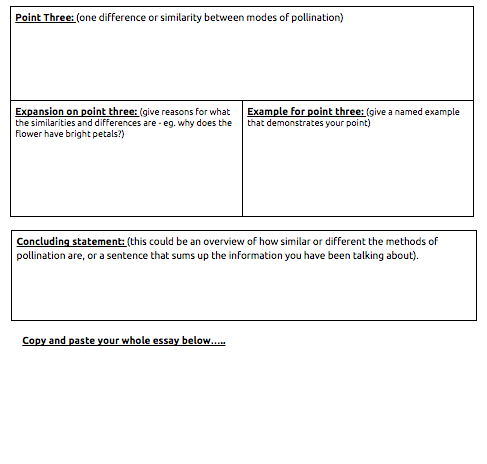 My MindLab assessments (and to be smart, my teaching as inquiry at the moment too!) is looking into what strategies and approaches I can change within my teaching practices in order to address this potential problem. Below is the first part of my inquiry into inquiries ;) - just identifying the issue. Watch this space for the next parts, which are looking into what strategies I can use, and then finally how application of these strategies works. Many thanks to the students who gave their honest feedback - and agreed for me to publish the video. I have come to really love the phrase 'enabling constraints'. It ties together so much of what I value in teaching: the ability to empower students with choice and freedoms by setting clear guidelines and high expectations. It also hints at the approach of 'warm and demanding' which we all aim to embody at HPSS. "You can't think outside the box unless you have a box"
I have been reflecting lately that since coming to HPSS, I have become much more adept at scaffolding tasks for students (prompted by many of the other teachers I work with, but particularly Lisa and Cindy) - and have noticed just how much this has helped the students I work with to have a clear grasp of exactly what I expect from them. In the past, I had just assumed that my students had somehow picked up the ability to write paragraphs and essays (by osmosis? from the English dept? probably not from physics?! - yes, I jest!)... but I never really took it upon myself to teach them how to communicate science ideas in a way that scientists most appreciate (and let's face it - NCEA markers appreciate). The content took so much time to teach that there was barely any time to talk about the Nature of Science, and certainly no time to teach about communicating in science. The end result was that I often gave copious amounts of repetitive feedback, which boiled down to: more content, more explanations, less waffle, don't repeat yourself, give named examples, why? how? when? etc. 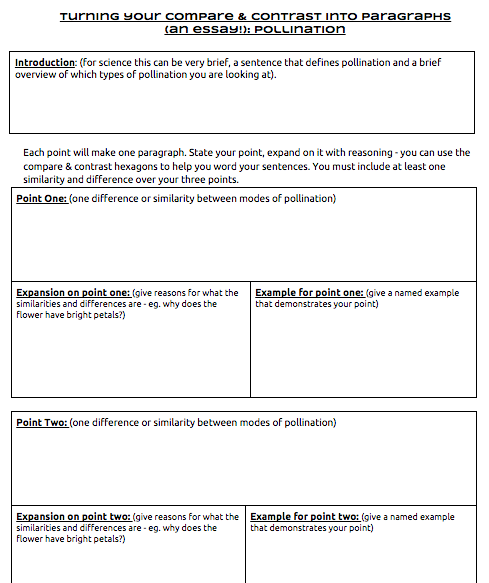 The resultant essays have really impressed me, in terms of their responses being concise, full of content with explanations given for every point made, named examples or evidence and no waffle(!) Given that they are written by year 10's at the start of the year, I have full confidence that our skills over content approach is working well - students soak up the content BECAUSE they have something to do with it, they are not learning facts for the sake of it. 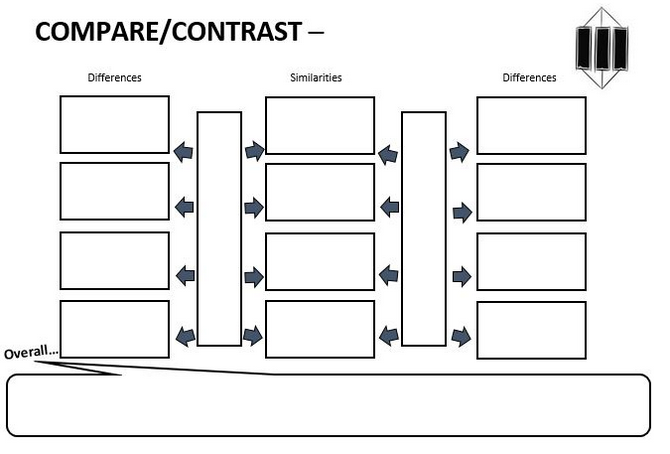 The key thing has been that our PEEL paragraph approach last year with the now year 10 students was aligned across the board - all learning areas used it, so students had the chance to consolidate, test and refine their practice. Our students are not 'pigeon-holing' their learning, but rather they see where cross-curricular tools can be applied, and they use them to good effect. (I am more than happy to share hexagons docs - I have a set of connecting words, plus a set of compare and contrast words; and the docs with scaffolding, should anyone be interested). A less-than-ideal weather situation while away for the long weekend lead to entertainment through jigsaw puzzles. Teaching analogies kept leaping at me off the table, and so I felt obliged to write some of them down.... as random as they might be! So what will I take from those ideas and apply to my teaching this term? I plan to let the students fill in some of the details for me - I have some vague/outlined plans in my head, but I can't put the puzzle together until I know what each student brings with them, and also what they want to learn about. The other thing in completing this 1000+ piece puzzle is that it took a good few hours to do, and there was no reward other than the task itself - but it retained (mostly!) interest as a satisfying and fun activity (especially as we didn't know what the end result would look like), and so motivation to complete it was intrinsically driven..... this also ties in nicely to Dan Pink's Drive which I have also been reading this weekend! A book that I have heard a lot about, and had secondhand information from, but have really needed to read myself to understand the messages on a deeper level (another teaching lesson - students need to DO not just hear about something to learn from it).